GeckoForums.net - Welsh Morphology took this wonderful photo of a beautiful black spiny-tailed iguana (Ctenosaura similis) in their collection. Facebook - Welsh Morphology took this nice photo of a fantastic five-keeled spiny-tailed iguana (Ctenosaura quinquecarinata). GeckoForums.net - A terrific looking spiny-tailed iguana at Welsh Morphology is settled into his new home and on the lookout for a meal. YouTube - Snake Discovery visits Cozumel to check out some wild black spiny tailed iguanas. 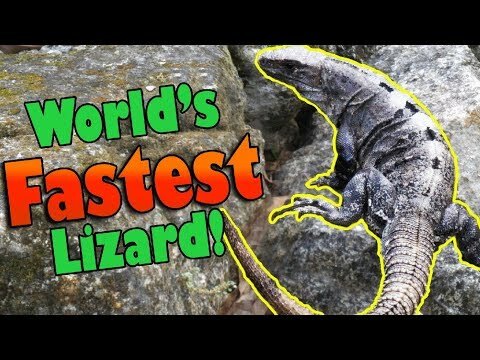 Learn about the world’s fastest lizard in this video, from diet to behavior. Australian Reptile Forum - Take a look at these good-looking golden spiny-tailed geckos (S. taenicauda) and their lovely vivarium. Facebook - Another outstanding reptile from Casey Lazik, this Spiny Tailed gecko is an incredible species! See the full size pic after the jump!